When my parents bought our first beanbags back in the 1970's, very few options were available. Both my brother's and my beanbag were the same size, with the same type of material, that of a rough sort of vinyl. The only difference was in color: burnt orange vs. avocado green. Luckily, those looking now for beanbags—whether for themselves, their children, or their pets—have many more choices available to them. Beanbags are no longer old-fashioned; there are many cool and unique options, with a beanbag for every style, size, and personality. Unlike the round poufs that I remember, the beanbag chairs and loungers available today can be found in multiple sizes and shapes. The flattened, sleeping style, for example, like those offered by Waste, are large enough to allow one adult to sleep comfortably. These beanbags would be perfect for those who like to relax in a cloud of support. Too, they are made from discarded car textiles, making them durable and functional. The green aspect of the product would certainly attract those consumers who are searching for environmentally friendly chairs and loungers for their home. Taking this style of beanbag and literally moving it to the next level, Le Beanock has successfully combined the beanbag with the hammock, producing a cushion-y lounge and chair that is both stylish and strong. This unique design makes it comfortable and supportive for special needs children in that there are no hard surfaces; the swinging motion of the Le Beanock also provides a safe environment for difficult times, such as illness or emotional distress. Smaller in size but still of great quality, the “LiL Me” bean bag chair would be a wonderful addition to any little girl's room. 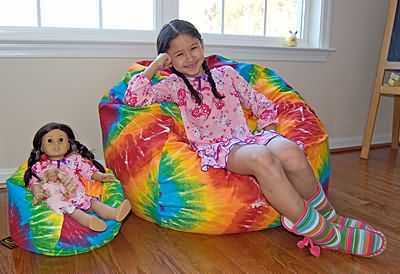 Now your young daughter can have a beanbag chair of her own, along with a matching one for her doll. These beanbags fit the American Girls dolls perfectly, but they would also provide comfortable seating for teddy bears and other dolls. By offering these smaller beanbags, Ahh! Products gives your little girl a chance to give her own “babies” a special place of their own. Although the more traditional pouf/ blob style of beanbag can certainly be the coziest seat in the house, there are various shapes that fit even the most chic home. With their spare colors and simple shape, the beanbag lounge chairs sold by Woodnotes would fit a modern interior design while still providing a fun and soft place to relax. Too, they maintain their architectural shape while still staying true to their beanbag origins. Similar in style, the SITT by Susanne Grønlund is a modern beanbag with a shape that is like a cylinder. Its special design offers more support than other beanbags and gives you the opportunity to sit easily in various positions. Also, as with the Woodnotes lounger, it maintains its shape and so adds interest to any seating arrangement. Companies currently selling bean bag chairs also let their customers express a sense of humor or whimsy in their choice of beanbags. For example, one of the most loveable beanbag chairs around is the Sleeping Grizzly Bear, which is sold by Chic Sin Design. With its textured covering, it provides you with a sense of a real grizzly with fur, giving you the chance to “hibernate” with the bears during the winter. Following with their obvious interest in nature and fun design, the same company also sells beanbag chairs and pillows shaped like wood logs, topiary balls, and even wads of money. These fun chairs and loungers would definitely be a conversation piece. For the Pokémon fan, the Snorlax beanbag chair would be the perfect addition to a gameroom. Any fan will recognize this cute character, and the patterns offered in this store would certainly make a great project for the crafter in you. This beanbag would cheer up anyone, whether teen or adult, true fan or novice. There are patterns you can find online to make your own. Finally, for the foodie who just can't get enough of their favorite edibles, this baked potato bean bag chair would be a great addition to their house. This functional soft sculpture is created by hand, providing the purchaser with a truly unique item. The butter pillow gives it added interest, along with a soft cushion for your head. If you want a bean bag chair customized to your own specifications, then Ahh! Products gives you the chance to design your own beanbag. By sending your own fabric to Ahh! Products, you can get a beanbag with your own personalized style. Whether it is for a certain purpose or a special someone, they can make a beanbag chair just for you. You can have your beanbag chair your way, without worrying about whether or not it will be the right size or color. If you want a unique beanbag, then definitely look to Ahh! Products for your order. Ahh! 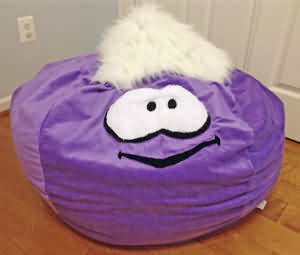 Products has even made custom tennis ball beanbags and an adorable purple Puffle bean bag chair for customers! Beanbags have come a long way since my brother and I first sat in ours back in the 1970s. Beanbag chairs now can be found in a shape, color, or even character that will fit your home and personality. Modern or funky, beanbag chairs are fun and functional choices for any family. Do you own any of these or other super cool or unusual bean bags? Please share - send in a photo and we will post it for all to admire! Special Thanks to Guest Blogger Krista Schnee for this really fun article!